I recollect a colleague of mine from Northern part of India telling that in their menu, he had never seen drumstick. When he along with his friends hired a cook, he prepared a drumstick curry with rotis. These bunch of friends apparently told cook, if at all you prepare anything with this vegetable, we are going to find replacement for you. I pity – not the cook but this bunch of friends as they fail to explore potential of drumsticks. One can make several dishes out of drumsticks. They are healthy and tasty. 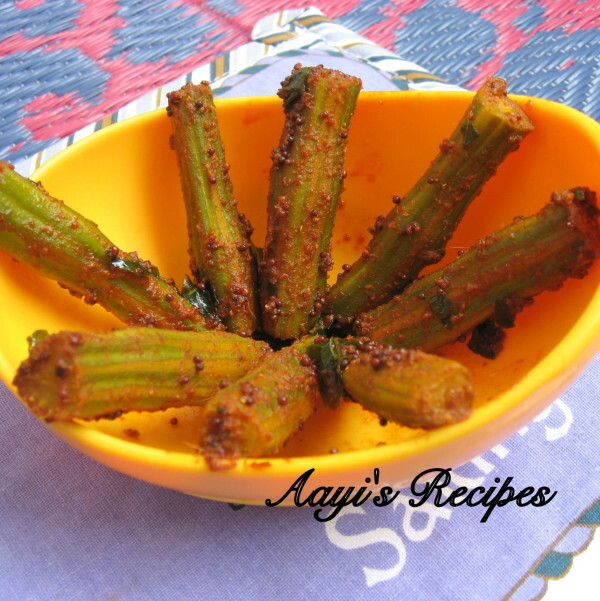 This spicy drumstick fry is invention of my wife – Its simple, quick to prepare, healthy and tasty. 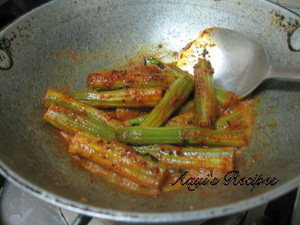 A typical side dish that fits well in today’s fast paced life. If there are kids in family, they have strange liking for drumsticks and nothing like it. Cut, peel drumstick and put it in water. Cook them with a pinch of salt. Heat oil, add seasonings and all spices. Add the cooked drumstick and mix. Take out these drumsticks and discard the water. 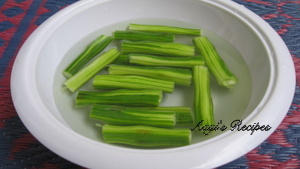 Cook drumsticks in water with pinch of salt for around 10 mins. Discard water and keep it aside. In a pan, heat oil. Add mustard seeds, curry leaves, allow them to splutter. 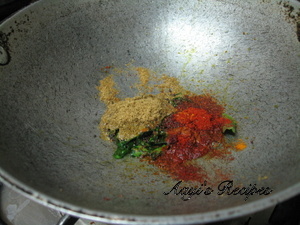 Add asafoetida, chilli powder, turmeric, coriander powder and salt. Fry for 2 mins on low flame. Ensure nothing gets burnt. 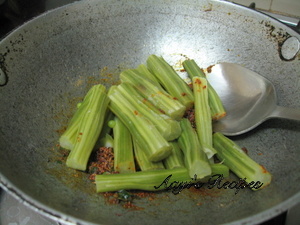 Add cooked drumsticks to this and fry for another 5 mins. 2 tsps of water can be added so that spices are coated evenly to the drumsticks. Serve the spicy drumsticks with hot rice as side dish. i like your recipe “Spicy Drumstick Fry” i like so much indian recipes i am owner of Aggarwal Sweets in canada i want to use this recipe in my restaurants. What will remain in drumsticks if its boiled & water is drained off? Today I tried this..Very nice tast..